Disappearing State is the actual physical disappearance of a state, the loss of its territory or land, similar to the story of Atlantis. The disappearance is caused by the fact the land mass of the states becomes submerged below sea level. The Earth’s geophysical map has remained constant of the past millennium. However, with the problem of climate change, it is believed that the status quo could soon be altered and the change would come sooner than expected. A State, especially coastal States, are in threat of disappearing because climate change, whether natural or induced, would cause sea levels to rise. In, effect, the lives of the people living in these areas would be greatly affected as homes, food, and security are endangered by the sudden displacement. 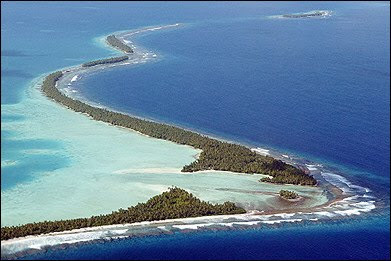 Island States, such as Tuvalu, Kiribati, Marshall Islands and the Maldives are the current example of states threatening to disappear. Since the late 1980’s this issue has long been recognized, however the proximate cause of such threat has not been the primary focus of the solutions entertained and presented. Instead of addressing how climate change maybe avoided thus saving these states from drowning, people have opted to focus on environment refugees would be protected or assisted in case the inevitable happens. The inevitable would only take place if people would do nothing to circumvent the realities that climate change would soon bring if we do not act now. The harsh reality is that sea levels are rising drastically. The logical immediate option when vulnerable island states would lose their territory is to migrate to another territory that is most likely a State in itself. The problem is: who would want to give part of their land to these environmental refugees when the cost is their own precious land and of course the host States resources that would have to be shared to them. People might think that the effects of a drowned State would not reach other States. The fact is, as soon as actual States do disappear, the existing international laws that people are accustomed to will have to be reconsidered and reconfigured to adjust to the occurrence and address possible conflicts this happening could also bring. It is high time that resolutions to this looming problem be focused and directed on the issue of drastic climate change and how it can be decelerated.